Discounted open dates! New Home, Hanalei, walk to beach & town See my reviews. Recent construction provides a fresh and modern home with tropical flair. This home has all the best upgrades: Ipe floors, granite counter tops, top of the line appliances, custom tiled showers and bathrooms, screened in lanai, outdoor showers, high speed Internet, two flat screen TV's and Ipod docking stations. Relax and enjoy a very comfortable floor plan. Enter this home on the ground floor, with a family room and a master bedroom/bath suite. Both rooms have direct access to the lower lanai and grassy backyard. The master suite features a double shower and walk in closet. Up the staircase is the open concept living room, dining room and kitchen, which lead out to the screened in lanai. Another master suite is located up stairs, with a walk in shower and closet as well. The third bedroom, also located on the second floor, is the kid's bunk room. One bunk bed has two double mattresses, the other bunk bed has a twin over a double mattress. The kid’s room has its own bathroom. The kitchen has been completely equipped with everything you can imagine you'll need. This is a family-style home and has been outfitted with a family in mind. The home is located at the end of a quiet cul de sac, just two blocks from the beach, and another 4 short blocks into the center of Hanalei. The back of the lot borders the Hanalei Fish Ponds - just a big open patch of tall grass rustling in the breezes! Surf board and bike rental packages available. Our family love Hanalei and have been coming to the island since 1996. I love the big surf out at Hanalei Bay while my wife and kids love the perfect rollers that are breaking on the inside. We love hiking and exploring the island's many beaches and waterfalls. Hanalei is paradise found. Family friendly beachs and town with quality surf for everyone. Walk to the beach and town. Set up to accomodate a big family and entertaining. toilet, shower, Dual Vanity, walk in shower and private toilet room. toilet, combination tub/shower, Dual Vanity. shower, Large private outdoor shower with foot rinse. Views of Bali Hai, and countless waterfalls. Two sets for each bed. Two car parking in driveway directly in front of the garage. Please do not park on the grass. two car garage. Guest beach chairs, umbrellas and toys are all easy access. Everything you need to prepare a Thanksgiving meal or a beac BBQ. Dinning room table seats 8, the adjacent table on the screened in lanai seats and additional 4-6. Boogies Boards, beach chairs, umbrella, sand toys. We had a great week at Hale Makai. The house is beautiful, has a great layout, and is very well appointed. We loved it's location, too - close to the beach but very private. 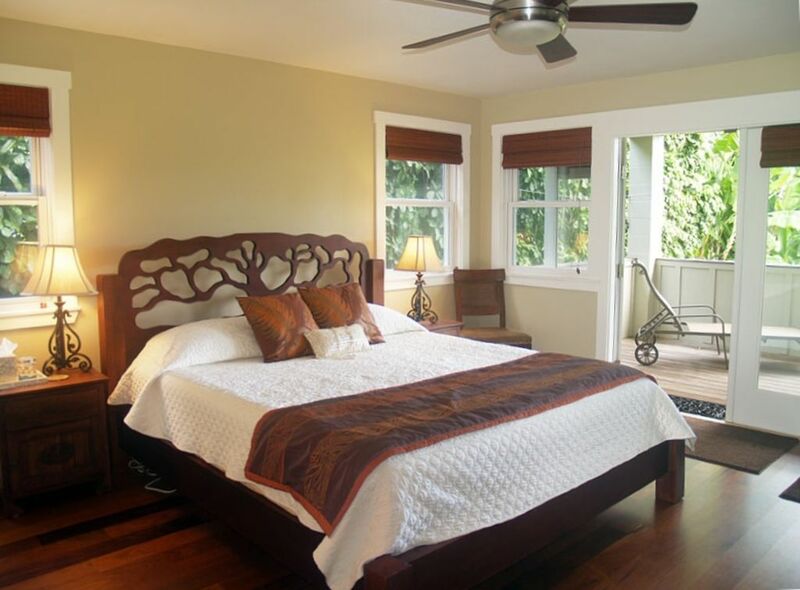 Easy breezy hanalei stay — great for whole family! House is well organized, comfortable, and close to beach and town. House had certain items which made our stay easy with family like surfboards, beach chairs, beach towels, sand toys, beach cart, etc. Hanalei Yoga was a great way to start the day for the adults and whole family enjoyed surfing and playing on the beach each day. Picked up fresh fish several days at the Dolphin Fish Market for grilling a family dinner at home. This trip was so relaxing and enjoyable for everyone! Bountiful hale among the magnificent face of the north island with breath taking views. Bountiful hale among the magnificent face of the north island with breath taking views in every direction. We loved spending our honeymoon here, had so much fun and plan on coming back very soon. House was spacious -plenty of room and privacy for 6 adults. Loved the quick, easy access to the beach, yet away from the busy beach area. Easy access to town -everything you needed. Loved the idea of being away from the busy south-southeast areas but close enough to visit. Sitting out on the deck overlook, watching the sunrise, was the best morning routine you could ask for!! Would highly recommend the home -got a great place here! Julie and Tony thought of everything a family would possibly need to make this a comfortable home away from home. My family immediately felt comfortable in this well appointed home and were blown away with the spectacular views. We were down the street from an amazing beach in Hanalei Bay and minutes from the quaint city center with many shopping and restaurant options. We spent mornings around the kitchen planning out our day’s adventure and our evenings around the grill in the screened out lanai recollecting our favorite memorable experiences. We were only a family of 4 so we had more than ample room, but felt that the house could accommodate double the number of people. Thanks again to the Bardin family for all the tips and for being such gracious hosts. We look forward to visiting the garden island of Kauai again I’m the future. Beautiful property with a lot of room. It is fully stocked for great beach days. Thank you! Rates are subject to change until owner replies for dates more than 1 year out. No parties or unauthorized guests are allowed on the property. Security deposit is refunded 7 days after checkout.